I'm using dosbox with win 3.1 in it. Most things work fine except for Photoshop 4.0. It freezes the moment PS 4.0 starts. Last edited by dehavilland on 2014-1-30 @ 18:11, edited 3 times in total. Do you have the S3 video driver installed? What resolution are you running Windows 3.1 in? Jorpho wrote: Do you have the S3 video driver installed? What resolution are you running Windows 3.1 in? Yes I have installed the S3 video driver. Resolution is 1024x768, I tried 800x600 and it also crashes. What about the color depth? Jorpho wrote: What about the color depth? I have tried 256 32K 64K but none is OK.
dehavilland wrote: I have tried 256 32K 64K but none is OK. So W31 still displays 16 colours "only"? Maybe, I failed to notice any change in the color. All right... How about one of the other video drivers? Jorpho wrote: All right... How about one of the other video drivers? I'm sorry but the title of this post is wrong. Not crash, but freeze. Well I tried all these video drivers. ET4TURBO with svga_et4000:Windows will become more 'colorful', but it only have 256 colors(All 64k colors belongs to ET4000 configuration:( ) PS 4.0 make dosbox freeze again but without reporting XGA errors, only "terminate called after throwing an instance of 'int' "
svga_et3000:Windows will not display properly. paradise:Windows will not become more colorful, also PS 4.0 make dosbox freeze but without XGA errors. Well, I'm just about out of ideas. Maybe it's time to give up and use PCem instead. What if you change the cpu_type to a 386 or a 486? Or have you tried installing the Photoshop 4.0.1 update? Well this is the 'last moment' of running PS 4.0 with an S3 driver (1024x768x64k) It is a Chinese version of Win3.1 (PWIN3.2). Last edited by dehavilland on 2014-1-30 @ 18:27, edited 1 time in total. Jorpho wrote: Well, I'm just about out of ideas. Maybe it's time to give up and use PCem instead. Now I'm trying to rollback and see what will happen. Yes, Win32s normally requires the cpu_type to be adjusted, but maybe Photoshop also requires this. It's worth a try, anyway. I looked up the system requirements and saw that the program's minimum requirement was a 386 and that it included special optimizations for Pentiums. Maybe the regular version of Windows 3.1 will work better? 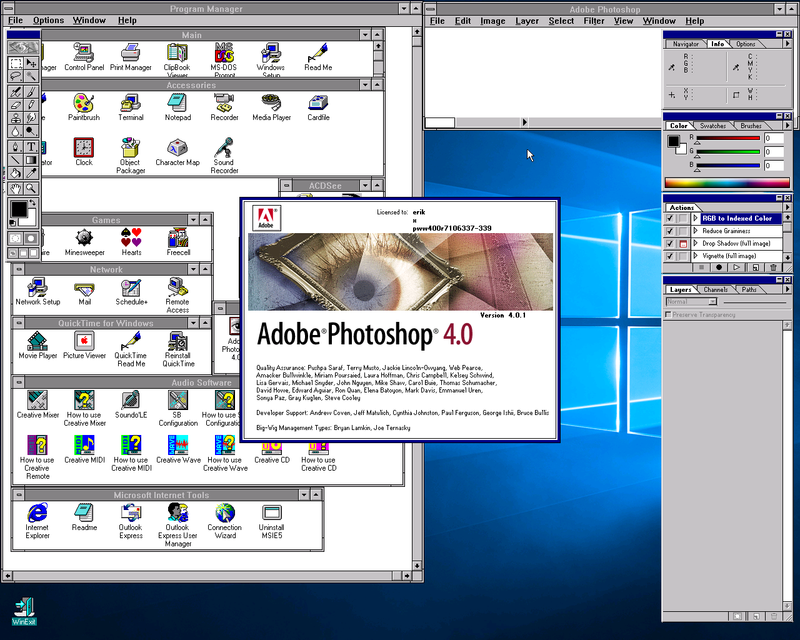 Win32s compatibility with Photoshop to version 3.x: http://stephan.win31.de/w32slist.htm#list (Installer may give trouble by crashing in module <unknown> v3.0). Command 3 is CMD_RECTV1 (fill rectangle in y direction). Not implemented in DOSBox. I didn't find documentation about port bda3. In my case it was because of QEMM 97: do not use the optimization of QEMM. it is possible to just use MagnaRAM to have a RAM manager.